View cart “Epergne Crystal Replacement Bowl With Cobalt Highlights. 10.75″ Diameter” has been added to your cart. Epergne replacement large round crystal glass bowl. 11″ Diameter x 4″ high. The foot stepped. The smallest step is 4.5″ diameter, the largest step is 7″, so this can fit an opening of anywhere from 4.5″ all the way upto 7″+. It has a heavy cutting and is in good condition We have a huge selection of epergne replacement crystal bowls. Please check our other listings on ebay, or feel free to visit out Manhattan gallery for an even larger selection. Please check your measurements before purchasing. If measurements are tight, please email me to confirm. Bowl weighs 2115 grams. Most if not all items are antique or used items, and as such nothing is ‘perfect’, but we always will describe any damage, repair, inscriptions, monograms etc to the best of our ability. Please ask any questions BEFORE purchasing or bidding on any item. All weights & measurements are approximate, but as accurate as possible. Please view all the pictures as they form part of the description. All items are available to inspect, and pick up, at our Manhattan gallery. We do not ship to PO Boxes. We use Fedex Ground shipping, and a signature is required for delivery. Don’t forget we offer free ground shipping anywhere on mainland USA. We ship worldwide. Please contact us for a shipping quote. Epergne replacement large round glass bowl. 13.5″ Diameter x 4″ high. 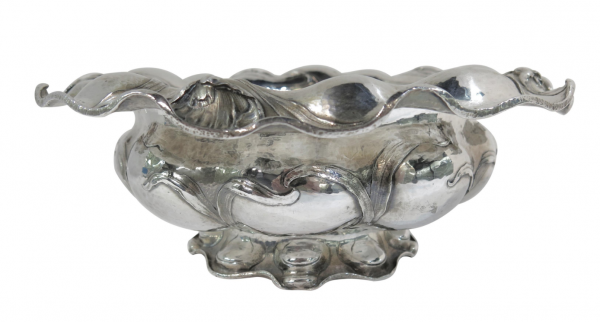 The foot is 5.75″ diameter We have a huge selection of epergne replacement crystal bowls. Please check our other listings on ebay, or feel free to visit out Manhattan gallery for an even larger selection. Please check your measurements before purchasing. If measurements are tight, please email me to confirm. Bowl weighs 2765 grams. Most if not all items are antique or used items, and as such nothing is ‘perfect’, but we always will describe any damage, repair, inscriptions, monograms etc to the best of our ability. Please ask any questions BEFORE purchasing or bidding on any item. All weights & measurements are approximate, but as accurate as possible. Please view all the pictures as they form part of the description. All items are available to inspect, and pick up, at our Manhattan gallery. We do not ship to PO Boxes. We use Fedex Ground shipping, and a signature is required for delivery. Don’t forget we offer free ground shipping anywhere on mainland USA. We ship worldwide. Please contact us for a shipping quote. Epergne replacement large round glass bowl. 9.75″ Diameter x 3.5″ high. The foot has a maximum diameter of 5.5″ diameter. We have a huge selection of epergne replacement crystal bowls. Please check our other listings on ebay, or feel free to visit out Manhattan gallery for an even larger selection. Please check your measurements before purchasing. If measurements are tight, please email me to confirm. Bowl weighs 1485 grams. Most if not all items are antique or used items, and as such nothing is ‘perfect’, but we always will describe any damage, repair, inscriptions, monograms etc to the best of our ability. Please ask any questions BEFORE purchasing or bidding on any item. All weights & measurements are approximate, but as accurate as possible. Please view all the pictures as they form part of the description. All items are available to inspect, and pick up, at our Manhattan gallery. We do not ship to PO Boxes. We use Fedex Ground shipping, and a signature is required for delivery. Don’t forget we offer free ground shipping anywhere on mainland USA. We ship worldwide. Please contact us for a shipping quote. Epergne replacement large round glass bowl. 13.50″ Diameter x 4″ high. The foot is 5.7″ diameter. We have a huge selection of epergne replacement crystal bowls. Please check our other listings on ebay, or feel free to visit out Manhattan gallery for an even larger selection. Please check your measurements before purchasing. If measurements are tight, please email me to confirm. Bowl weighs 2530 grams. Most if not all items are antique or used items, and as such nothing is ‘perfect’, but we always will describe any damage, repair, inscriptions, monograms etc to the best of our ability. Please ask any questions BEFORE purchasing or bidding on any item. All weights & measurements are approximate, but as accurate as possible. Please view all the pictures as they form part of the description. All items are available to inspect, and pick up, at our Manhattan gallery. We do not ship to PO Boxes. We use Fedex Ground shipping, and a signature is required for delivery. Don’t forget we offer free ground shipping anywhere on mainland USA. We ship worldwide. Please contact us for a shipping quote. Epergne replacement round crystal bowl. 8.25″ Diameter x 4″ high. We have a huge selection of epergne replacement crystal bowls. Please check our other listings on ebay, or feel free to visit out Manhattan gallery for an even larger selection. Please check your measurements before purchasing. If measurements are tight, please email me to confirm. Bowl weighs 836 grams. Most if not all items are antique or used items, and as such nothing is ‘perfect’, but we always will describe any damage, repair, inscriptions, monograms etc to the best of our ability. Please ask any questions BEFORE purchasing or bidding on any item. All weights & measurements are approximate, but as accurate as possible. Please view all the pictures as they form part of the description. All items are available to inspect, and pick up, at our Manhattan gallery. We do not ship to PO Boxes. We use Fedex Ground shipping, and a signature is required for delivery. Don’t forget we offer free ground shipping anywhere on mainland USA. We ship worldwide. Please contact us for a shipping quote. Epergne replacement round glass bowl. 10″ Diameter x 2″ high. We have a huge selection of epergne replacement crystal bowls. Please check our other listings on ebay, or feel free to visit out Manhattan gallery for an even larger selection. Please check your measurements before purchasing. If measurements are tight, please email me to confirm. Bowl weighs 967 grams. Most if not all items are antique or used items, and as such nothing is ‘perfect’, but we always will describe any damage, repair, inscriptions, monograms etc to the best of our ability. Please ask any questions BEFORE purchasing or bidding on any item. All weights & measurements are approximate, but as accurate as possible. Please view all the pictures as they form part of the description. All items are available to inspect, and pick up, at our Manhattan gallery. We do not ship to PO Boxes. We use Fedex Ground shipping, and a signature is required for delivery. Don’t forget we offer free ground shipping anywhere on mainland USA. We ship worldwide. Please contact us for a shipping quote. Epergne Replacement large round glass bowl. 10.2″ Diameter x 5.5″ high. The base diameter at the tip is 1 1/8″”. Please check your measurements before purchasing. If measurements are tight, please email me to confirm. Bowl weighs 955 grams. Most if not all items are antique or used items, and as such nothing is ‘perfect’, but we always will describe any damage, repair, inscriptions, monograms etc to the best of our ability. Please ask any questions BEFORE purchasing or bidding on any item. All weights & measurements are approximate, but as accurate as possible. Please view all the pictures as they form part of the description. All items are available to inspect, and pick up, at our Manhattan gallery. We do not ship to PO Boxes. We use Fedex Ground shipping, and a signature is required for delivery. Don’t forget we offer free ground shipping anywhere on mainland USA. We ship worldwide. Please contact us for a shipping quote. Epergne Replacement large round glass bowl. 11.6″ Diameter x 4″ high. The foot has a maximum diameter of 4.25″. Please check your measurements before purchasing. If measurements are tight, please email me to confirm. Bowl weighs 2,715 grams. Most if not all items are antique or used items, and as such nothing is ‘perfect’, but we always will describe any damage, repair, inscriptions, monograms etc to the best of our ability. Please ask any questions BEFORE purchasing any item. All weights & measurements are approximate, but as accurate as possible. Please view all the pictures as they form part of the description. All items are available to inspect, and pick up, at our Manhattan gallery. We do not ship to PO Boxes. We use Fedex Ground shipping, and a signature is required for delivery. Don’t forget we offer free ground shipping anywhere on mainland USA. We ship worldwide. Please contact us for a shipping quote. Replacement round epergne bowl in hand cut crystal & cobalt. 10.75″ diameter at top. The stepped foot makes it useable to fit most any round epergne frame. The smallest diameter of the bottom step is 3.2″. The height of the bowl is approx. 4″. In very good condition. No chips, breaks or cracks. Replacement round epergne bowl in hand cut crystal & cobalt. 10.75″ diameter at top. The stepped foot makes it useable to fit most any round epergne frame. The smallest diameter of the bottom step is 3.15″. The height of the bowl is approx. 4″. In very good condition. No chips, breaks or cracks. One Of A Huge Selection Of Crystal Replacement Epergne Bowls. This Is A 7″ Diameter Bowl, Standing On A Graduated Stepped Base. The Diameter Of The Steps Vary Which Mean It Can Fit A Variety Of Openings. This Particular One Has Steps With Diameters Of 2.5″,2.1″, 1.8″, 1.35″ and 1″, So It Could Fit Anything With An Opening Of Between 2.5″ Down To 1″, But Obviously They All Vary Slightly As They are Hand Cut. Hundreds Of Other Sizes & Styles Available, By The Piece Or Complete Sets..
One Of A Huge Selection Of Crystal Replacement Epergne Bowls. This Is A 9″ Diameter Bowl, Standing On A Graduated Stepped Base. The Diameter Of The Steps Vary Which Mean It Can Fit A Variety Of Openings. This Particular One Has Steps With Diameters Of 3.7″, 3.2″,2.7″, 2.4″ & 2″, So It Could Fit Anything With An Opening Of Between 3.75″ Down To 2″, But Obviously They All Vary Slightly As They are Hand Cut. Hundreds Of Other Sizes & Styles Available, By The Piece Or Complete Sets.. If You Are Looking For Replacement Crystal Bowls For Your Antique Epergne’s, I Have A Vast Selection Of Over 1000 Pieces. Individual Bowls Or Sets. Small & Large. All Cuts, Styles & Periods. This Set Consists Of The Large Center Bowl, And 4 Matching Side Bowls, All In Perfect Condition. This Will Fit Most Centerpieces, As It Has The Stepped Bases That Will Sit In Most Frames. If You Only Need 3 Side Bowls, I Can Discount The Set By $150.00.. If You Are Looking For A Different Style Or Cutting, Send Me Your Measurements, And Perhaps A Photograph Of Your Piece, I Can Find You A Suitable Replacement.. We Are Also Able To Copy A Rare Crystal Piece By Re-blowing & Hand Cutting To Your Exact Specifications, But This Does Take Time, And Is A Lot More Expensive.. Feel Free To Contact Us For Further Information … We Also Have A Great Selection Of Antique Silver Epergnes In Our Large Ever Changing Inventory..
Set Of 5 Epergne Bowls. 1 Large & 4 Small. The Large Is 10cm Tall With A Diameter At The Top Of 30cm, And A Diameter Of The Foot Of About 11.5 cm. The Small Bowls Are 7.5cm Tall x 10.75cm Diameter At Top, And The Foot Is About 6.5cm Diameter. .. I have Other Styles And Sizes Of Epergne Bowls Available In Sets Or Single Bowls. Some Are Antique, And Some Are 20th Century. We Are Also Able To Make An EXACT Copy To Replace A Broken Bowl Or Liner, But That Can Be Very Expensive And Takes Time. Feel Free To Call Or Email Us For Further Details. An Excellent Quality Hand Pierced & Engraved Sterling Pedestal Dish With Grape & Vine Border. Made By Viners Of Sheffield. .. This very handsome, George III style , sterling silver basket, features a beaded border around the rim and foot, reed detailing around the handle, and a wonderful hand engraved & pierced decoration around the upper body. Made in London by Crichton Brothers, dated 1915. 14.25″ x 11″ x 11.25″ tall with the handle up and 5″ inches with the handle down. 1,050 grams. Large, Oval Centerpiece Made By Christofle. The Workmanship Is Typical Of The Parisian Silversmith, With Beautiful & Intricate Cast Detailing. 24″ x 18″ x 4.5″ High. Epergne Replacement Crystal Bowls. Large Crystal Center Bowl & 4 Side Crystal Bowls To Match. We Have Over 1000 Pieces Of Crystal Glass, For Epergne Replacement, In Our Huge Inventory. We Can Sell Single Bowls In A Variety Of Sizes & Cuts, Or We Can Supply You With An Replacement Entire Set. Please email me a picture of the bowl needed and also a picture of the epergne that it is needed for. I will need dimensions of the bowl needed to replace. The most important measurement is the EXACT opening of the metal ring that the bowl sits into. I only have round bowls in stock. Oval, custom shapes or custom designs can be blown & cut to order, but are much more expensive and take a long time. Large And Very Decorative Sterling Silver Epergne With Seven Detachable Baskets. A Large Oval Center Basket, With Six Smaller Matching Side Baskets. Pierced And Chased Decoration With Garlands. Standing On Four Feet. Antique English, George III, Sterling Silver 4 Arm Epergne / Centerpiece. Large Center Crystal Bowl With 4 Matching Side Bowls. Each Arm Is Numbered And Can Be Detached From The Main Frame Of The Epergne. Each Piece Is Fully & Correctly Hallmarked. There is a very small, later, hand engraved presentation inscription on the lower rim of the epergne, that reads as follows; Presented To Arthur C Newsum Esq By The Members Of The Association Of Wagon Financing Companies, As A Mark Of Their High Esteem And In Appreciation Of The Valuable Services Rendered By Him As Chairman During The Years 1912-1920. York, 3rd November 1920. GEORGIAN STERLING SILVER EPERGNE: Early George III, Sterling Silver & Cut Glass Epergne By Thomas Pitts, London 1760. Raised on four scroll supports on openwork feet, base and detachable central basket pierced with quatrefoils and stars, openwork apron of flowers and foliage, four detachable scroll branches topped with silver-mounted cut-glass baskets fully marked. 18 1/2″ x 18 1/2″ x 12″ high. A monumental, European, sterling silver , massive wine cooler. Approximately 5,600 troy oz (175 Kilo) (385lbs)54 inches (137cm) wide49 inches (124cm) tall36 inches (91cm) front to backAfter the original by C F Kandler, London 1735.The original was commissioned by Henry Jernegan (Jerningham), a London banker, who wanted to posses the largest ever wine cooler celebrating the pleasures of wine. It took the silversmith Charles Frederick Kandler four years to make. When it was finished in 1735, it weighed over 8,000 ozs. In 1737 Jernegan offered the cooler as a lottery prize to raise funds for a new bridge over the Thames at Westminster. Silver medals were sold as lottery tickets for about five or six shillings each. The winner, Major William Battine, appears to have sold the cooler to the Regent Anna Leopoldovna of Russia in 1738. Since 1743 it has been in the Hermitage, St Petersburg. 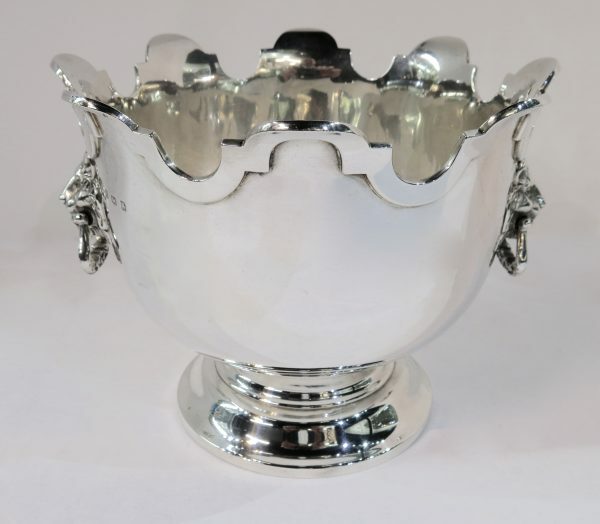 This sterling silver wine cooler, one of 4 copies known, is just another example of the fine, rare, collectible, usable, everyday, museum & investment items that are always for sale at EstateSilver.com and at our Manhattan gallery. The other three copies are silver plated and can be seen at the Victoria & Albert Museum in London, The Metropolitan Museum in New York, and the 3rd silver plated copy is in the collection of the Her Majesty The Queen’s Regimental Silver. This is the only known sterling silver copy, and is the only one that is available for sale.